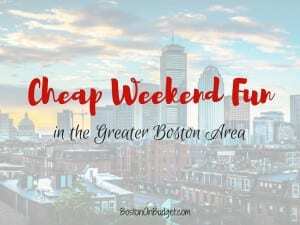 Cheap Weekend Fun in Boston for September 8-9, 2018! Happy (almost) weekend! Here are some fun and cheap things to do this weekend in Boston for September 8-9, 2018! Facebook Get Together at Museum of Science: September 8-9, 2018. Enjoy this Facebook Get Together with Buy 1, Get 1 Free Admission to the Exhibit Halls at the Museum of Science this weekend. The Boston Arts Festival 2017: September 8-9, 2018 from 11-6:30PM at Christopher Columbus Waterfront Park. Enjoy this annual event designed to showcase the performing and visual arts in Boston. Free. Cambridge Carnival: Sunday, September 9, 2018 from 12-6pm in Cambridge. Head to Cambridge for this festive celebration with a grand costume parade, international foods, crafts, and more! Riverfest: Saturday, September 8, 2018 at Assembly Row in Somerville from 12-9. Enjoy a day of live music, children’s activities, evening fireworks over the Mystic River, and more! 92nd Annual Italian Feast of Saints Cosmas and Damian: September 7-9, 2018 in East Cambridge. Enjoy this annual Italian Feast with food, entertainment, parade, amusement rides, and much more! Carnival of Dogs: Saturday, September 8, 2018 on the Greenway from 10-2PM. Enjoy a day of dog-friendly activities and vendors in North End Park. Somerville Dog Festival: September 9, 2018 from 11-3PM at Trum Field in Somerville. Enjoy a day of family-friendly activities (and dog!) with contests, demos, vendors, and more! JP Music Festival: Saturday, September 8, 2018 from 12-7pm in Jamaica Plain. Enjoy a fun and free day of music, food trucks, and more in JP for all ages. ZUMIX Radio Block Party: Saturday, September 8, 2018. Head to East Boston for this radio block party with live music, food, beer garden, lawn games, and more.